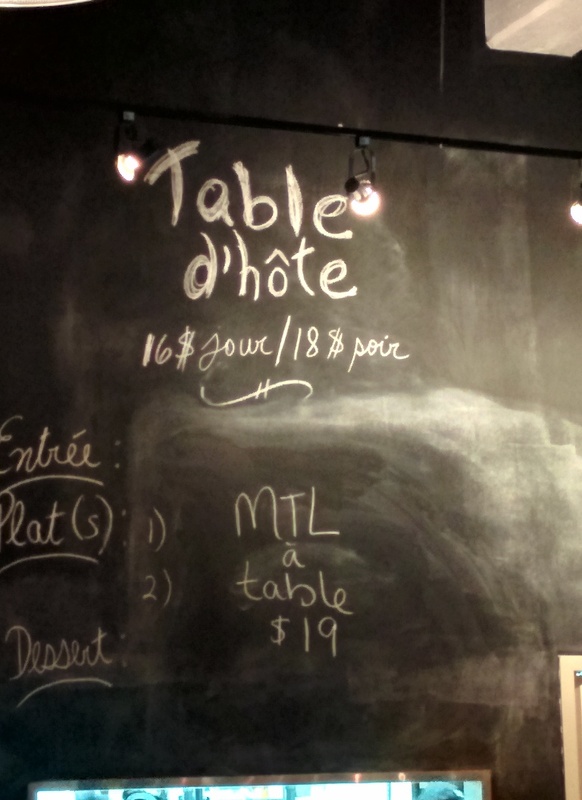 With one day left in the Mtl à Table festival, I made it out to one hot spot featuring a modest $19 table d’hôte. I was shrewd to made reservations a few weeks in advance as I grabbed the last of the 8 p.m. seating’s for Saturday night at Montreal Brewing Company. Along with this brewpub on my 40 must-try places, Griffintown is also a place I don’t think I have ever set foot in. I don’t think I have ever been south of St. Jacques, so I had to google-map Ottawa street. The nice thing about dining out in a neighborhood where condominiums are in the midst of being built and factories that appear barren (but may be the scene for some afterhours parties)… there is plenty of free parking on early on Saturday night! Vegetable Croustillant Pesto Cream. Montreal Brewing Co. Photo Esther Szeben. The menu was not your typical pub fare as this brew-pub-come restaurant had some very nice international spins on the common English pub fare. The appetizers were inspired by Greek filo pastry: the vegetable “croustillant” with pesto sauce had an oriental spring-roll taste to it, and the Pesto was very light on the basil, so it didn’t strike me as very Italian. 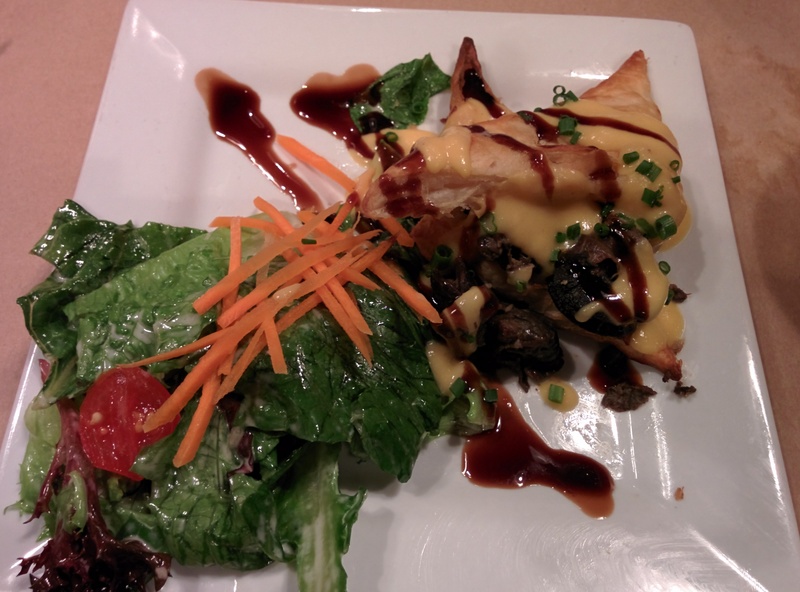 The second appetizer was also a flaky pastry triangle with a few escargot scattered on the plate with a squash and pepper sauce drizzled on top. Unlike French snails, these were not sautéed in garlic and as such seemed a bit bland. Both appetizers were served with a small green salad with a house dressing. 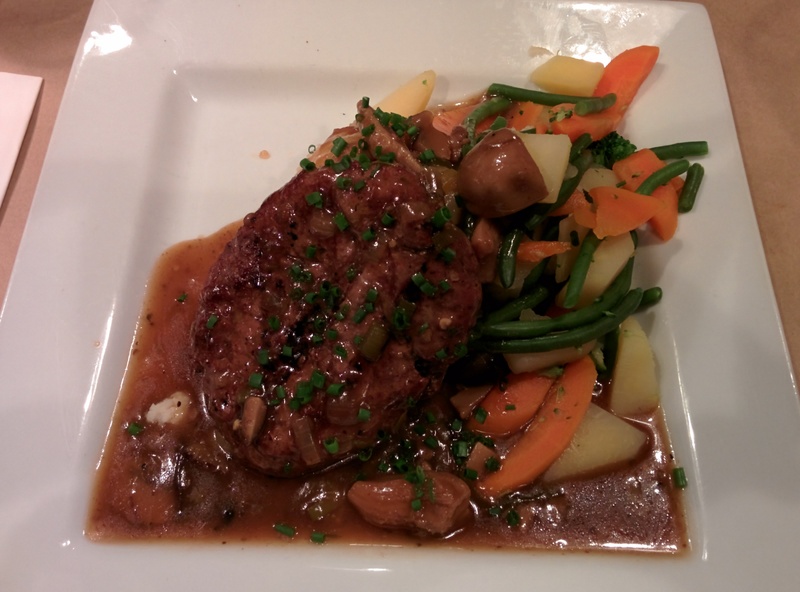 The main courses were very hearty and filling and were very nice autumn spins of typical English pub fare. 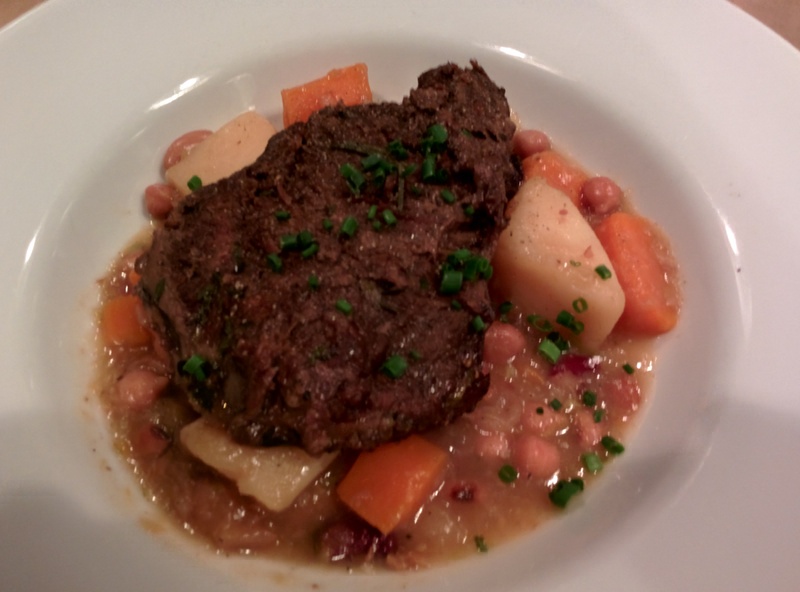 A very generous portion of braised beef cheeks with their signature Rebelle québécois beer with beans and smoked bacon on a bed of stewed root vegetables left us quite full. I found the amber beer was very slight in the sauce and the smokiness of the bacon was so subtle, I missed it. The Bison burger in a wild mushroom demi-glace with a side of mashed potatoes and autumn root vegetables, was far more tangy, savoury and extremely filling. Vanilla Coffee Stout. Montreal Brewing Co. Photo Esther Szeben. I was disappointed with the IPA, my favourite ale. Theirs is very citrusy and light and heavier on the malt than the hops. The Foreign Extra Stout was very nice, with notes of chocolate and coffee. Dessert was also served with the menu and I was too full to finish mine, but somehow I managed to pack away their Cranberries and Apple Crumble topped with a dollop of freshly whipped cream. I really wasn’t hungry and thought I would stop at a sampling bite, but the tanginess of the light fruit was a great way to cleanse my palette after the heaviness of the meat and game. The Pudding Chaumeur was made with their own Vanilla Coffee Stout, which we also ordered as a pint of to finish off our meal. 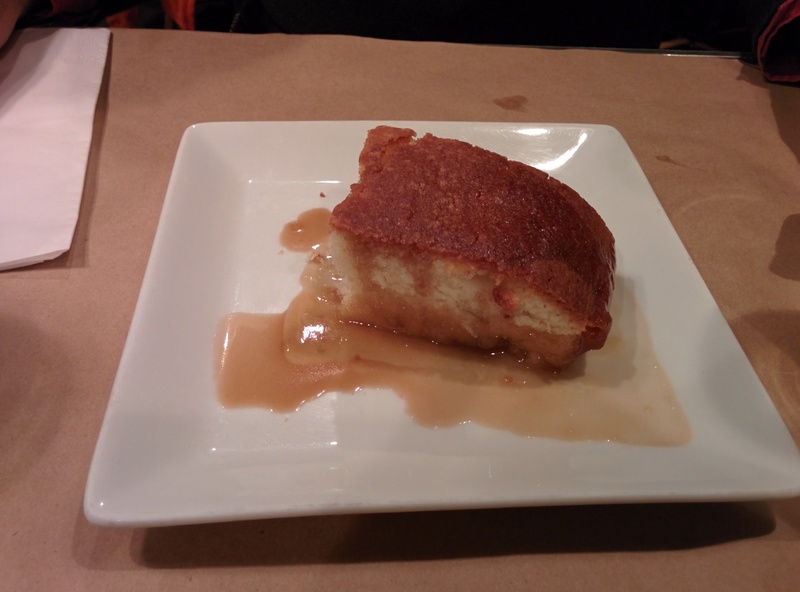 The stout alone would have been dessert enough for me, as the cake was rather bland and there wasn’t enough sauce. Bison Burger and Wild Mushroom. Montreal Brewing Co. Photo Esther Szeben. This pub takes pub food to the next level. 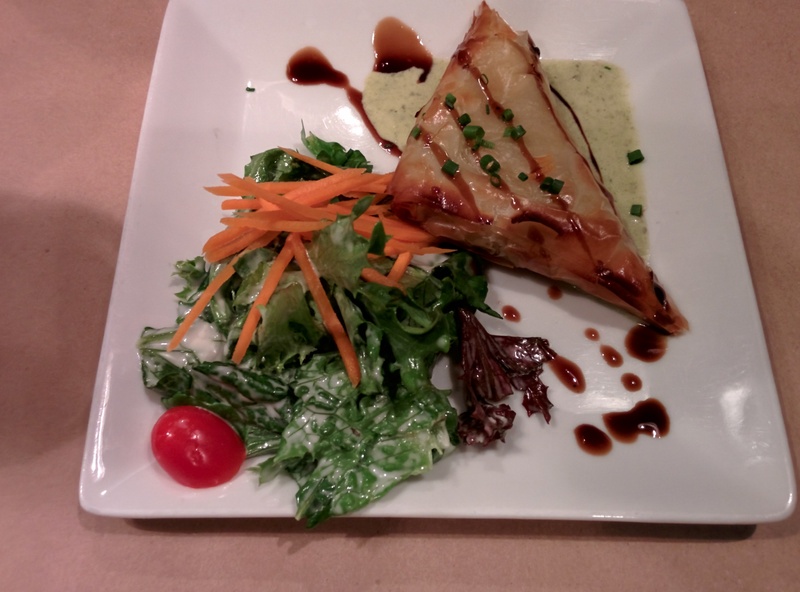 You won’t get your average chicken wings or pot-pies, but this little gem tucked away South, South of downtown Montreal, is out of the way but worth a bargain $19 three course meal. Montreal Brewing Co. is located at 1485 Ottawa. Got a hot food tip for Esther? Send it to fourtyandfamished@gmail.com.